Jane Jacobs’ influence can be felt all over New York through street activations and placemaking activities. This week’s #atinytask project in Chelsea Triangle was a perfect example. 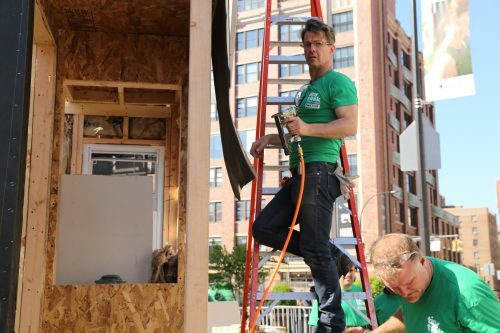 The project engaged users of the popular work sharing website, TaskRabbit, to build a tiny house in 72 hours. These New Yorkers were chosen from various skills and trades and were all paid a living wage through the site. 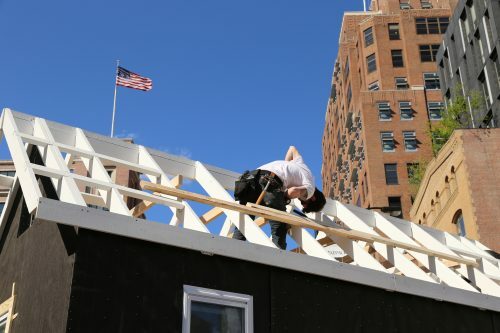 The build itself took place in the middle of Chelsea Triangle at 14th St and 9th Ave, which meant that pedestrians could observe and interact with it at every step. On Thursday, TaskRabbit staged an all-day open house where people could tour the home and enjoy themselves on the live sod comprising its front yard. Hundreds of passersby popped in for a few moments of peace and quiet, with many remarking, once inside, that they forgot they were in the middle of a crowded city. The Tiny House serves a greater purpose as a symbol for community and rethinking how communities to work together to tackle complex challenges. If we can build a whole home in 3 days, what other problems might we be able to solve together?